Oscar-bound & Brilliant! Melissa Leo in “Novitiate”! I was hesitant, I admit, to see “The Novitiate.’ I was named for a nun, Sister Mary Stephen, who was my aunt. 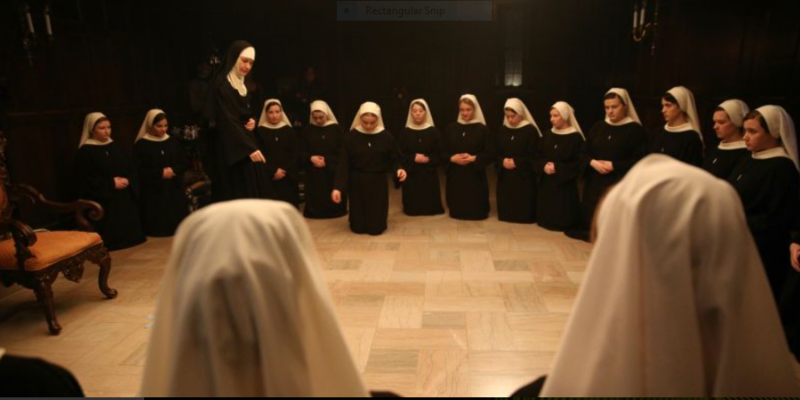 But I was totally blown away and moved by “The Novitiate.” My childhood was surrounded by nuns. My aunt was a Sister of Mercy and I was taught by Sisters of Charity in Catholic school. However, “The Novitiate” is done with a great deal of respect. And it is, in its own way, devout. It’s such a closed world and this film gives a glance, albeit a partial one, into what goes on beyond those mysterious, eternally closed convent walls. 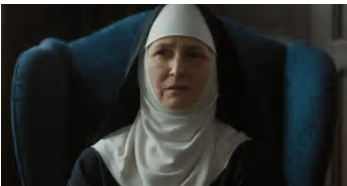 I should now take the time to point out that previous Oscar winner Melissa Leo gives one of the performances of the year(And her career) in “The Novitiate.” She’s mean Mother Superior here, and this role challenges her on every level imaginable and she meets every one with a ferocity and power that is staggering. She is in a nun’s habit for the whole film. Her wimple is similar to my late aunt’s, but my aunt had a severely starched head band and collar and bib, plus the black trailing veil that Melissa Leo wears in the film. However, Leo’s collar is not starched. It moves when she moves her face and neck, and therefore allows much greater freedom of expression in close-up. And for most of the film, we see all is the faces of the actresses in tight close-ups. “Novitiate” is profound and enthralling because it takes its holy subject, women and their relationship with God, so seriously. I was not surprised to find out that “Novitiate” was directed AND written by a young first-time director, Maggie Betts, who must’ve been a former nun. Right? Wrong! She was a socialiate. Her family a close one to the Bushs, and my god does this make “Novitiate” an even more powerful debut. Not particularly religious herself, Betts claims that she found the truth of her subject matter through research. It is the 1960s and the Cathoic Church is be-set with all kinds of changes initiated by Pope John Paul XXIII and Vatican II. 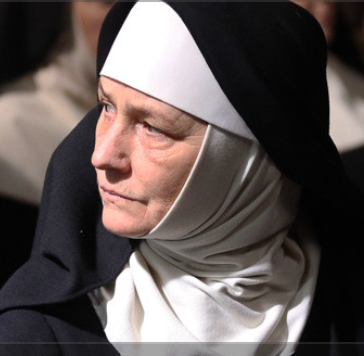 Melissa Leo’s Mother Superior wants none of this and her (Fictional, I guess) religious order and the nuns in it are known for their strictness. My cheerful, lovely Aunt Anna, was not subjected to the various forms of “punishment” that Leo’s Mother Superior “Just call me Mother” meets out. But the silence and the prayers and the discipline were similar if no the same. My Aunt felt she was married to Christ, and it was a happy marriage for her. It’s a leading role, but she’ll be considered in Supporting, because Best Actress is so jammed this year. It’s just unbelievable. And that a woman director, directed and wrote this her first feature is truly impressive. Oscar Supporting Actress Possibilties Are Piling Up!